There’s a difference between spooky and scary. (SPOT.ph) Words can spook you without resorting to chainsaw type tricks. We all know this from childhood, as our elders told us stories that caused goosebumps and raised the hairs on the back of our necks in the same manner as cave-dwelling children must have experienced huddled around the communal fire at night. The basic reason for such stories is therefore as old as humanity itself—to build tribal solidarity, to warn of the dangers of the unknown, the “Other,” who might grab you and gobble you up or somehow leave you changed, endangering not only yourself but the group. Whether our fear and fascination with monsters dates to the time when Neanderthals co-existed with our homo sapien ancestors (preying on early humans, allegedly; though early DNA studies suggest people with red hair carry Neanderthal DNA, which has since been disproved, Eurasians carrying 1-4% of Neanderthal DNA has been taken by some to suggest a kind of opposite theory, that early humans raped Neanderthals), or to earlier, residual memories of giant and dangerous beasts, is something being explored by scientists. In the end, human behavior includes different ways of coping with fear: the fight or flight instinct; the innate caution that comes from experiencing inexplicable and thus possibly lethal, phenomenon and the need to communicate these lessons however hazily the causes are understood; and the ability to communicate, in turn, fear from an individual to the community. When we gather in a movie house to watch a horror movie, we do so out of individual choice but also, to have a communal experience. We can experience fear in two ways: we can be spooked or horrified. Spookiness requires the active assistance of our often hyperactive imaginations; horror requires big doses of gore and violence. As chronicled by John Markoff in one essay in The Rise and Fall of the French Revolution, the “Great Fear” was an outbreak of paranoia in rural areas, as a political crisis engulfed France in 1789. Rumors began to spread that the King, bandits, merchants, what have you, were going to swoop down on farmers to take their grain. The farmers formed militias; urban residents panicked. The government panicked. The French Revolution followed. The reason everyone was paranoid about their grain, we now know, was something called the Little Ice Age, which lasted three centuries (from the 1300s to the mid-1800s!). What it’s really about is France, about a generation before the French Revolution, and thus a few decades before the “Great Fear,” but about an outbreak of a great fear—over sightings of giant wolf-like beasts roaming the woods, snatching children playing on the outskirts of towns, and growing in frequency and ferocity as Winter sets in and food becomes scarce. The writer and reader, Aaron Mahnke, has a youthful yet serious voice, and tells his stories—his Lore, accumulated from old tales—quietly, truly hauntingly. No dramatic effects, but lots of mood-setting, equally haunting, music. You won’t get nightmares from his tales, but you will, as you listen to them, feel uneasy, not least because much that is already familiar is presented from a different perspective. Who hasn’t heard about werewolves? But these are werewolf stories you haven’t heard before, and what is uniquely Lore-like are things like the clincher that comes at the end of the tale—that of one hunter who was quickly forgotten after his 15 minutes of fame in the reign of Louis XV—but who had set out after having had a priest bless his bullets, which were made of silver. Aha! So that’s where that essential element of fighting the supernatural with guns began. Mahnke’s Lore has turned into a small industry, and deservedly so. Lore is all over. It has a website which links to his podcasts, Facebook, and a Twitter account, promoting the book version of his accumulated stories. 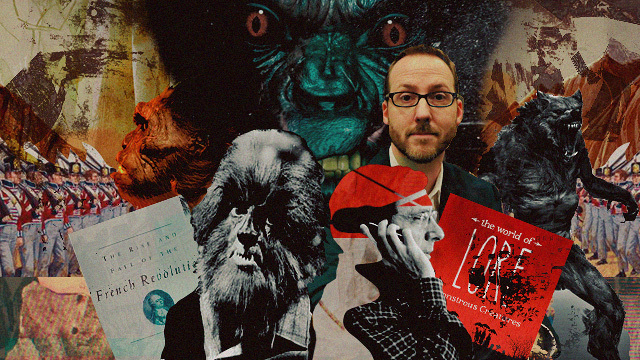 The man behind all of these, Aaron Mahnke, even has his own site. But Lore is a constantly evolving creative undertaking. Now it’s gone visual. In case you have Amazon Prime, you can watch the TV series of Lore. Featuring a collaboration with two individuals connected with the TV series’ The Walking Dead and The X-Files, Mahnke’s stories have become multimedia experiments, each episode having a different feel in terms of how it’s visually expressed, with the essential elements any regular listener has come to love: the quiet, deliberate, understated voice of Mahnke, the mood-setting music; and now, animation and pictures and, if you watch it on your computer screen, simultaneous sidebars providing historical and other backgrounds to the unfolding tale. Season 1 has six episodes, ranging from the belief in New England in the 1800s that the only way to prevent the spread of tuberculosis—commonly called “consumption’ in the 19th Century—was to make sure that “the dead are actually dead,” to a doctor named Walter Freeman who decided lobotomies using an icepick were a dandy cure for mental illness afflicting the criminally insane, to the belief in Ireland that someone you know could suddenly be replaced by fairies with a changeling —and how people came to believe this and what solutions they resorted to. Lore isn’t an old-style radio drama. It’s storytelling with a modern sensibility while tackling tales as old as humanity’s fear of the unknown and inexplicable have existed. Prepare for a proper haunting.